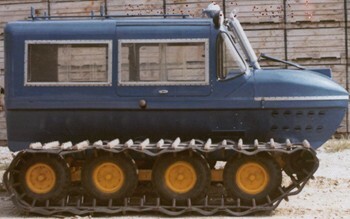 The KT-3 was the best selling of all Kristi tracked vehicles. With optional seating for 5-6 adults and the introduction of the Porsche industrial motor, the KT-3 was also the fastest Kristi. A new finger-tip controlled "Ski-Action" lever would make the Kristi able to steer without the use of the brake levers. Full rear door and optional right side hatch (as pictured) make the KT-3 add ease of entry and exit. The following is a filtered view of the official Kristi vehicle logbook displaying the KT-3 model. Click the serial numbers to the left to view KT-3s in the registry. If you have a KT-3 and would like to add to the registry, just email us.